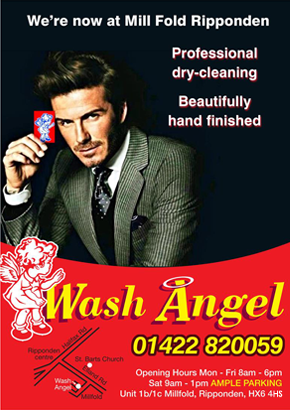 Wash Angel has been providing a professional dry-cleaning, laundry and ironing service to the Calderdale area since 1999. Owner Martin Goodman has 40 years of experience as a master dry-cleaner and still conducts dry-cleaning and laundry seminars to similar shops across the UK as well at some of the worlds top hotel chains and also for the Carnival P&O Group cruise liners where quality has to be at the very highest. Wash Angel offers an exemplary dry cleaning and laundry service focused on high quality clothing, meticulous fabric care and discreet and attentive service. All the staff at Wash Angel are known for their friendly counter service and all are experienced operators and finishers using original 'Hoffman' steam pressing techniques using the very latest hand-finishing equipment. The dry-cleaning service is provided by our own state of the art environmentally friendly Hydrocarbon dry-cleaning machinery which enables us to process all forms of dry-cleaning on site including very delicate evening wear, wedding dresses and leather and suede garments. We are proud to have many regular customers from as far away as Manchester and Leeds who appreciate our hard work and commitment. The intense training all our staff have undertaken ensures the quality standards at Wash Angel are renown throughout the industry. Our slogan ”Professional Dry-Cleaning, beautifully hand finished" says it all. Wash Angel also specialises in offering a same-day ironing service where we use our same high tech dry-cleaning finishing equipment for all our ironing garments ensuring beautiful hand finished pressed clothes. At Wash Angel we provide a full laundry valet shirt and duvet cleaning service which means that we can take care of all your laundry, dry-cleaning and ironing needs at our same site in Ripponden near Halifax. And.. we offer a SAME DAY SERVICE FOR NO EXTRA CHARGE!! In fact we pretty much clean everything including a shirt service, rugs, curtains and upholstery, Ugg boots, handbags, leather and suede garments, beaded and sequinned garments even we also offer a full alteration and repair service! We offer a top quality services every time and have built up an excellent base of happy customers. From a single garment to a consignment of hotel linen, we offer the same care and expertise. You be assured that your items will be cleaned to the highest standards, always achieving the same brilliant results. We're proud of our superb local reputation, which is built upon repeat customers and personal recommendations. We are also proud members of The National Association of the Laundrette Industry and The Guild of Cleaners and Launderers.